Optional standard height bracket with Dsub for trigger,etc. support pixel clock frequencies up to 85 MHz. One 26-pin 3M MDR Camera Link connector for Base. 9-pin connector for Trigger, Frame Enable, Strobe, and General Purpose I/O. Supports cameras with data output rates up to 250 MBytes/second. 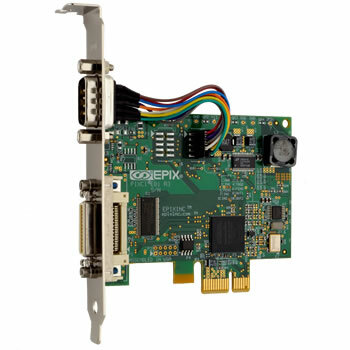 Operates in PCI Express x16, x8, x4, or x1 slot.